The best part of having a badge is you can bust it out for all kinds of perks. Need to get into the club without waiting in line? Flash a badge. Tired of not getting something for free? Flash a badge. Need to investigate something but they won't let you past the tape? Flas ha badge. You don’t want to end up like those folks who don't have a badge. They're not getting into any investigations! 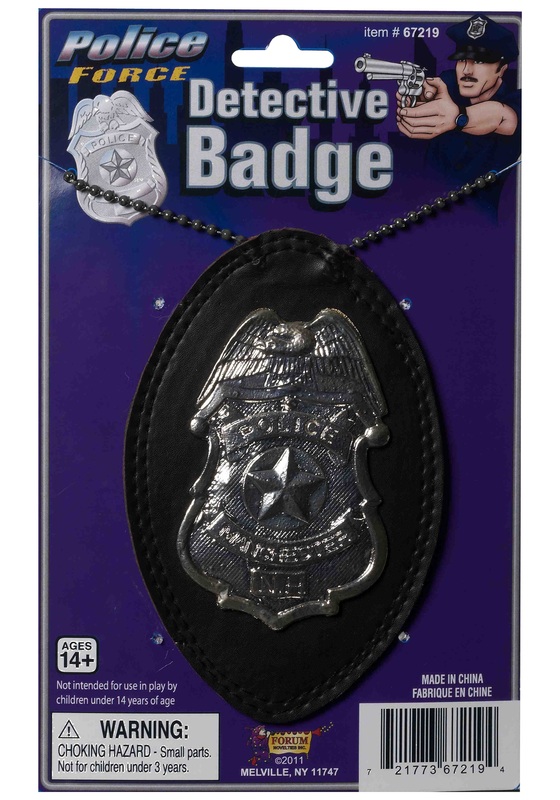 Not only do the bad guys get away, but your Captain is less than thrilled with you, to say the least… To ensure that you never find yourself in this awkward situation, take our advice, and get yourself a badge or two or three. You know, for back up. This silver badge is molded to look exceptionally authentic and is even put on a handy necklace piece to wear around your neck. It's very shiny, and will likely inspire respect when whipped out! You may have a uniform and title but without a badge, you are nothing! Trust us, once you flash this emblem, criminals will stop in the name of the law, but probably not love. So, grab your vest, hat, badge, and maybe the occasional doughnut, because you are only human, after all, and go be somebody’s hero! But remember the old Spidey training that with great power comes great responsibility, so don't use this badge for evil, pranks, or anything that would be wrong! Keep it cool, and have fun.